1. 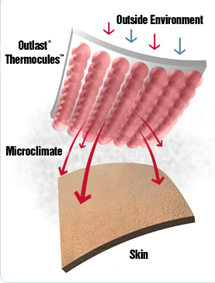 Your skin is exposed to temperature changes that affect the body’s microclimate. 2. When you overheat, your body naturally releases excess body heat and sweat to cool the skin. 3. 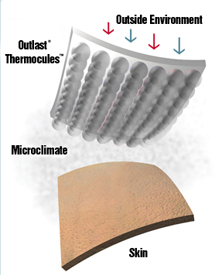 Outlast® technology enables the head pad to absorb the excess heat and store it in patented Outlast® microcapsules called Thermocules™. 4. When you start to cool, the stored heat is released back to the top of the head. 5. 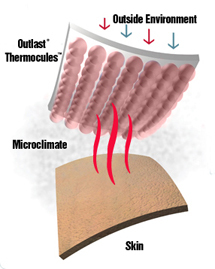 The result is a constant 'comfort zone' between the head pad and the top of your head ─ no excess heat buildup or hot spots.